It is the waiting time of year. Waiting for Christmas. Waiting for presents and presence. Waiting in lines and on the phone. Waiting for lift off. For me, this time of year is called Advent – the Coming. I wait to celebrate the first coming and anticipate the second coming. It is the time of year that I am counseled – rightly – to slow down, use this waiting time to get ready, to reflect, to notice. At the same time, I think about people who spend most of their lives waiting. The homeless folks I see once a week wait for everything – food, a bed at night, paperwork, transportation, the phone. There are women and men who wait months and years and decades for children that never come. There are people who wait for loved ones to die. For a lot of people, there is nothing novel about slowing down and waiting. Maybe I can learn just by looking around. 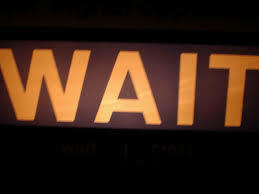 Waiting is part of what it means to be human, starting from our origins of making others wait for us to arrive. Almost always, waiting is for the unknown (do you really think you can guarantee what is coming?) but we don’t have to wait alone.